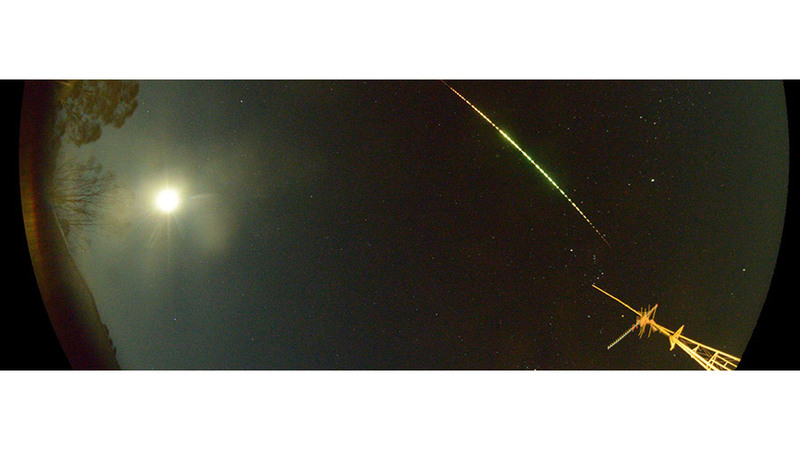 A fireball streaks across the sky. Near-Earth Objects and fireballs recently made the news once again, with tiny asteroid 2018 LA disintegrating over southern Africa just hours after being discovered. Have you observed any interesting shooting stars recently? Did you know that you can contribute your observations to the science of Near-Earth Objects? The Fireballs in the Sky program makes it easy and fun to become a citizen scientist! Fireballs in the Sky is an exciting citizen science program dedicated to tracking the direction of bright meteors across the sky. This project is the outreach arm of the Desert Fireball Network, an all-sky robot camera network set up to record fireballs. The DFN uses multiple sightings of a fireball's path across the sky in order to reconstruct the original, pre-entry orbits of these meteors in an attempt to better understand the makeup of our solar system. Information about a fireball's path can also be used to recover meteorites from their falls by calculating their final position; as of May 2018, four meteorites have been recovered from these "observed falls" as part of the program. Finding a fresh meteorites, even with this extra help, is still quite a challenge! By quickly finding and recovering meteorites as quickly as possible, the project scientists hope to get a better look at the original chemical makeup of these space rocks, which helps gain insight into the materials present at the dawn of our solar system. How can you participate? Download the Fireballs in the Sky app (or visit the website) and keep it handy while you watch the night sky! The app is available for both Apple and Android devices and allows you to submit detailed fireball reports very easily. 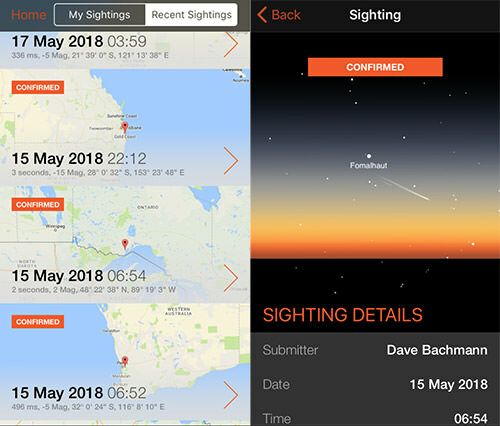 The app also has a few extra features, including interactive maps of sightings around the world and details about upcoming meteor showers. Once installed, you can use the app to easly report fireballs. You will first be asked to report on if you heard a sound accompanying the fireball sighting or not. Then you will be asked to point your phone in the direction that you saw the fireball, and recreate its path in the sky by tilting your device to "draw" the path you saw. Once you are satisfied with your recreation, you will then be asked to fill in a few additional details about the duration, shape, brightness, and color of the fireball before submitting the report. You can see recent reports - including yours, once accepted! - on the app or on their website at http://fireballsinthesky.com.au/maps/app-sightings/ . More eyes like yours watching for fireballs in the sky will lead to more robust data for the researchers of the Desert Fireball Network. Citizen scientists helps extend their vision beyond what the static set of desert cameras can currently catch. Your sightings could help scientists locate another meteorite fall, or help unlock one of the mysteries of the early solar system! If, after doing some citizen science, you find yourself wanting to share some of the amazing science behind near-Earth objects, meteorites, or craters, the Night Sky Network also offers up a wide variety of activities via our Space Rocks Toolkit. A great activity for summertime meteor shower observing parties is our "Heads Up! It's a Meteor Shower!" handout. You may even inspire some future planetary science careers among your visitors, too!